The most widely used method of Timber Frame Construction is Platform Frame Construction, this system is used nearly all North American, British and Scandinavian house builders. Each floor extends to the outside edges of the building and provides a platform upon which external walls and interior partitions are raised in single storey heights units. To the designer the method offers complete freedom of design and internal planning. To the developer the timber frame option means a guaranteed faster building time, less site labour. A choice of designs and finishes. Fully complies with all building and planning regulations. To the home owner it offers a soundly built, warmer extension. 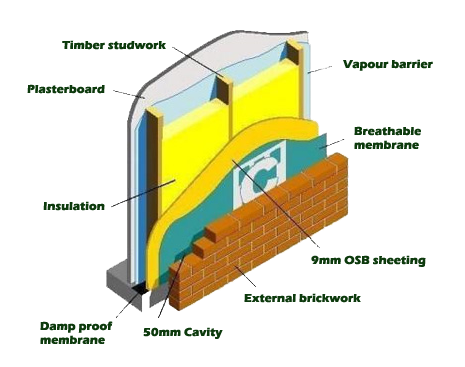 A higher standard of both sound and thermal insulation. Your extension will have a very high energy rating which is a great advantage in the valuation and sale of your home.